The random thoughts of an ancient wargamer. Featuring rules, battle reports, and all sorts of miscellaneous wargaming (and other) topics. 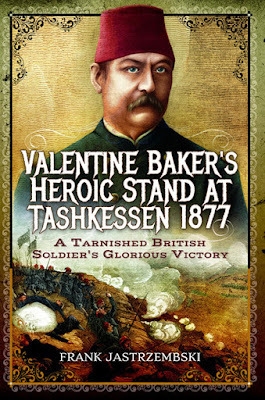 I was recently sent a copy of Frank Jastrzembski's VALENTINE BAKER'S HEROIC STAND AT TASHKESSEN 1877: A TARNISHED BRITISH SOLDIER'S GLORIOUS VICTORY to review. I have read Frank's articles in SOTQ (Soldiers of the Queen, the quarterly journal of the Victorian Military Society) and written favourable reviews about them, and the publishers decided to send me a copy of his book to review ... so here goes! I thought that I knew quite a bit about the life of Valentine Baker. I knew that he had a brother – Samuel – who was a very well-known explorer. One cannot be a student of the history of the British Army during the latter half of the nineteenth century and not have heard of his rise to prominence and his subsequent fall from grace. He was a friend of Fred Burnaby – one of my personal heroes – and I knew that the two had served together in the Balkans. Furthermore I had read about the disaster at El Teb, and whilst researching the life of Lord Kitchener for a talk to a Masonic Lodge, I came across references to Baker's daughter and the fact that Kitchener had hoped to marry her. I thought that I knew about Valentine Baker ... but this book proves how wrong I was! The first chapter of the book described Valentine Baker’s early life, and it was here that I discovered that he came from a distinguished family of seafarers and that he had three bothers (not just one), all of whom carved out careers in different fields of endeavour. I had not realised that Valentine had fought against the Sotho in South Africa and also taken part in the Battle of Chernaya during the Crimean War. I had also not known of his involvement in the exploration of Northwest Persia or that he had become something of an expert on Russia’s expansion in the East. I found Frank Jastrzembski’s coverage of the incident that led to Valentine Baker’s fall from prominence balanced and non-judgemental. He relates the fateful events in the railway carriage using the testimony given by Rebecca Dickinson (the alleged victim) at the time of the trial … but as Valentine refused to give evidence in his own defence, it is the only version of what happened on public record. His subsequent behaviour at the magistrate’s hearing and trial could be viewed as slightly bizarre by modern standards, but it is important to remember that he was a Victorian gentleman, and that he was expected to conform to a certain standard of social conventions that are no longer the norm. Foremost amongst these would have been to avoid causing distress to any female of the same or higher social class as himself, and the thought of allowing his barrister to cross-examine Miss Dickinson would have done just that. Likewise to call her account of events into question would have implied that she was a liar, something that no gentleman would have done. As a result he was convicted of a crime that he may well not have committed, a crime that he continued to pay for well after he had left prison. Chapter three explains in a very concise way the reasons why the Russo-Turkish War of 1877-78 broke out as well as giving a clear and balanced view of the strengths and weaknesses of the two opponents. The next two chapters then describe the events leading up to the action at Tashkessen, and I have never read a better short history of the opening part of the Russo-Turkish War. Chapter six describes the events of 28th to 31st December 1877 in enough detail for any reader to understand what happened, when it happened, and why it happened. My only complaint is that the absence of a map or maps within the chapter meant that I had to keep flipping backwards and forwards between the text and the maps that are in the middle section of the book to follow events in detail. But that is a minor quibble, and as a writer (and very small-time publisher) I know that this is sometimes unavoidable. I will not dilate here on the events covered in this chapter, but needless to say, as a wargamer, I wanted to set up the terrain at the earliest opportunity to see if I could recreate the battle myself. Chapter seven examines Valentine Baker’s subsequent career, and it strike this reader that he deserved better of his Turkish masters. His subsequent move to Egypt, where he was at least able to serve amongst a wider group of friends from his time in the British Army, should have afforded him the opportunity to exonerate himself. Unfortunately the existing Victorian social hypocrisy prevalent in London meant that he was forced to take command of the Egyptian Gendarmerie, an organisation that was in an even worse state than the Egyptian Army. He did his best he could with the very poor material he was given, and it is of no surprise that they were defeated at the First Battle of El Teb on 4th February 1884. He was obviously affected by this defeat, and his apparent reckless – almost suicidal – behaviour during the Second Battle of El Teb on 29th February seems to indicate that he may well have had some sort of death-wish or desire to atone for his failures by dieing a heroic death on the battlefield. In the final chapter of the book Frank Jastrzembski compares Valentine Baker’s conduct of the action at Tashkessen with several other famous rearguard battles … and it can rightly be stated that this was one of the finest to have been fought during the nineteenth century. I particularly liked the reference to Baker’s silver pocket watch being vital to his conduct of the battle. As he stated to Burnaby, ‘Every moment gained was so much time lost to the enemy’ … and that is exactly what he achieved. I thoroughly recommend this book to anyone with an interest in nineteenth century military history in general, and the Russo-Turkish War of 1877-78 in particular. It will also appeal to wargamers and those with an interest in the men who served Victoria’s Empire both in and outside her armed forces. I look forward to reading Frank Jastrzembski’s future books with great anticipation. 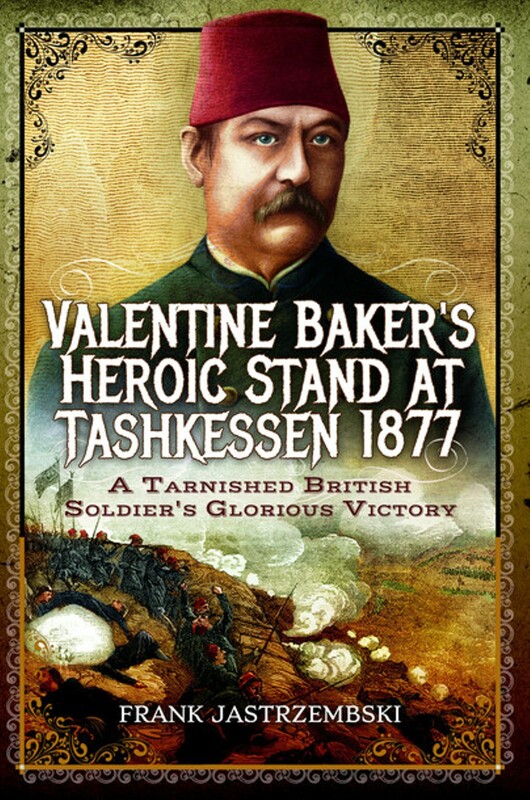 VALENTINE BAKER'S HEROIC STAND AT TASHKESSEN 1877: A TARNISHED BRITISH SOLDIER'S GLORIOUS VICTORY was written by Frank Jastrzembski, published by Pen & Sword Military Books in 2017 (ISBN 978 1 47386 680 5), and the hardback edition costs £19.99 ($34.95). I thought you would enjoy this book - and I was right! A very fair review. The one comment I would add to yours concerning the maps is the lack of any scale on all but one, which I found particularly irritating when reading the account of Tashkessen itself. I cannot believe that the original, highly detailed map did not have a scale! Only by careful reading of the narrative was I able to discover some distances between various points and thus arrive at an approximate scale - a pain if trying to reproduce the terrain for a wargame! I wonder whether you could recreate it as a Portable Wargame scenario? It was very much my kind of book ... and at some point I'd love to refight the battle as a wargame. I was disappointed with the maps of the battlefield that were included in the book, but I suspect that there probably were not that many available to choose from, and that these were the best they could find. That is one very compelling review! Are you compelled enough to buy a copy? I believe that it is available in electronic format if you don't want to buy the hardback edition. I'd have been more surprised if you hadn't bought a copy! Be tempted, be very tempted! I have a mint condition hardback review copy which I will send to anyone who wants it in UK for £10, second class postage included. A good book, just not my period! If I didn't already gave a copy, I'd buy yours! - Adapted from 'The Spirit of the Game' in 'The Rules of Golf' as published by the R&A Ltd.